The Story of Mankind, by Hendrik van Loon, read by Kara and Michelle. You can buy a lovely thick reprint of the original book, with dozens of lively illustrations, from http://mainlesson.com. Friday, July 31, 2009, is the 10th annual System Administrator Appreciation Day! A sysadmin unpacked the server for this website from its box, installed an operating system, patched it for security, made sure the power and air conditioning was working in the server room, monitored it for stability, set up the software, and kept backups in case anything went wrong. All to serve this webpage. A sysadmin installed the routers, laid the cables, configured the networks, set up the firewalls, and watched and guided the traffic for each hop of the network that runs over copper, fiber optic glass, and even the air itself to bring the Internet to your computer. All to make sure the webpage found its way from the server to your computer. A sysadmin makes sure your network connection is safe, secure, open, and working. A sysadmin makes sure your computer is working in a healthy way on a healthy network. A sysadmin takes backups to guard against disaster both human and otherwise, holds the gates against security threats and crackers, and keeps the printers going no matter how many copies of the tax code someone from Accounting prints out. A sysadmin worries about spam, viruses, spyware, but also power outages, fires and floods. When the email server goes down at 2 AM on a Sunday, your sysadmin is paged, wakes up, and goes to work. A sysadmin is a professional, who plans, worries, hacks, fixes, pushes, advocates, protects and creates good computer networks, to get you your data, to help you do work — to bring the potential of computing ever closer to reality. So if you can read this, thank your sysadmin — and know he or she is only one of dozens or possibly hundreds whose work brings you the email from your aunt on the West Coast, the instant message from your son at college, the free phone call from the friend in Australia, and this blog. On Saturday Henry had Combat Camp from 10-3 at his kung fu school (a couple hours of ground techniques and a couple of hours of weapons training). Dan and I watched some Warehouse 13 and the unaired Dollhouse pilot, and hung out together having a nice relaxing time, and then in the evening I dropped Henry off to meet his dad in La Jolla and Dan and I went on our date to night-time zoo, which was just fabulous! We rode the sky buckets over to the far side, walked slowly through the whole new elephant exhibit, and then caught the new bird show. Since I saw it with Henry and Fargo a couple weeks ago they’d added more lights and sound effects at the beginning, which was kind of annoying, but once they got on to actually showing birds and telling us about them and letting them do their bird stuff it was great. When’s the last time a HUGE owl flew silently right over your head, or you saw a toucan fly up to grab grapes out of the air, or you saw a maribou stork fly over a crowd of people with his toes dangling down in such a storky way? Gosh I love our zoo. We got out of the zoo about 9:30 and then had a late dinner at the Studio Diner. There were at least two tables of Comic-Con folk near us. We could tell by their unmodulated nerdy voices and topics of conversation. And we saw a Jayne Cobb hat! Yesterday I was a bit tired again but I baked two batches of blueberry muffins and a loaf of banana bread, and then I beat the Earth Temple in Wind Waker. What a game, what a mighty good game. No recording at all this weekend but maybe I’ll be able to finish the Swiss Family this week. There are only five chapters left. Last week I felt remarkably good most days. I wonder if I’m *finally* on the right dose of synthroid? I started my recordings on Monday the 13th, and am already more than halfway through the book! You can follow my progress here: http://librivox.org/forum/viewtopic.php?t=20254. Click the link at the top of the first post to be emailed when it’s all done and ready to download. Gosh, I just love this book. It’s possibly my favorite librivox project ever. So besides all the recording I did last week, I was productive in other ways, too, um, of course I can’t remember what I did but trust me, I did a lot of stuff. Not much knitting, though — it’s been too hot. Friday I got a migraine and then I didn’t feel very well the whole weekend and Monday, which was disappointing. I didn’t even have the ambition to record anything. But I dusted off Wind Waker and picked up my last savegame (2nd time through) in the middle and that amused me, though I still felt bad not being more productive. Today I felt a lot better again, and even went shopping! We’ve been wishing for just a few more plates, spoons, and forks so I went up to Macy’s and got some more Fiestaware, which was on sale. We bought our first Fiestaware back in December 2007, use it every day, and there’s not a chip or a scratch on any of it. And it’s bright and cheerful — our dishes are red, yellow, orange, turquoise, and a very light green. I got four more 9″ plates (two green, two yellow), two of the deep cereal bowls (green), four little red saucers (on clearance, and perfect for a single bagel), and two sets of red-handled flatware, which were on also on clearance! And then I went to the bookstore and picked out a few books for baby Ginny and 1-yr-old Jaylah, came back, packaged everything up with (with the little quilt for Ginny), and went out to ship both packages. Well, that doesn’t sound like much, I guess, but I swear it took half the day. Remind me to tell you about my love affair with the little propane grill another time. Walter Cronkite, “the most trusted man in America”, died today. Dad used to watch the CBS Evening News with Walter Cronkite every night when I was little; Walter’s voice was as familiar to me as if he were one of my own family. That was what The News looked like when I was nine. And that’s the way it is. By popular demand: instructions for cold-brewed coffee, which is always smooth and non-acidic and yummy! You need a jar with a lid. I use an old spaghetti-sauce jar. Put a scoop of high-quality ground coffee into your jar, and add, oh, a cup or two of cold water. I don’t measure, I just fill the jar about a third full. Put the lid on and give it a good vigorous shake. Leave it on the counter or the window sill until tomorrow. Next morning, give it another shake and pour the coffee through a filter of some kind. I use an Aeropress but you could put some cheesecloth or a napkin in a sieve, or use one of those single-cup filter thingies, or whatever. Your coffee will be rather strong, so you can thin it to your taste. I add about an equal amount of cold water, and if it’s a cold day I microwave it till it’s nice and hot. In summer I leave it cold or even add a few ice cubes. Then it needs a big spoon of sugar, and a good glug of heavy cream. Yummmm! Now don’t forget to start tomorrow’s coffee in your jar! I have a brand-new little 2nd cousin first cousin once removed, daughter of my cousin Jon and his wife Rosy! Time for a new book! This is The Story of Mankind, by Hendrik van Loon, an excellent history book for kids, published in 1922, winner of the very first Newbery Award. My friend Shell and I read this one as a duet, each taking every other chapter. So don’t be alarmed when you hear a voice that’s not mine! :) I love the way Shell reads and I hope you do too. Oh, by the way, you can buy a lovely thick reprint of the original book, with dozens of lively illustrations, from http://mainlesson.com. I want this poster. Luckily, the artist is planning to make prints of this and his other marvelous propaganda poster remixes (e.g Loose Tweets Sink Fleets)! I’m on the mailing list. Click the pic to go to his flickr stream and see the rest! United breaks guitars. Pass it on. I just love the indifferent employees! [The Sons of Maxwell] were traveling to Nebraska for a one-week tour and my Taylor guitar was witnessed being thrown by United Airlines baggage handlers in Chicago. I discovered later that the $3500 guitar was severely damaged. They didn’t deny the experience occurred but for nine months the various people I communicated with put the responsibility for dealing with the damage on everyone other than themselves and finally said they would do nothing to compensate me for my loss. So I promised the last person to finally say no to compensation (Ms. Irlweg) that I would write and produce three songs about my experience with United Airlines and make videos for each to be viewed online by anyone in the world. Monday was entry pick-up day at the fairgrounds. Celia had to get her snowglobe collection from Kids’ Best (she won first place and a special award!) and I had to get my Home and Hobby entries (three 2nds and an Honorable Mention), so Bob, Chloe, Celia, Henry, and I all carpooled up there together, which was great fun! We spent the whole time laughing, I swear. First we went to Kids’ Best in the infield, across the scary shaky one-lane bridge, and got Celia’s collection. With five of us helping, it took no time at all to get the snowglobes safely wrapped up, and then we drove back around to the grandstand where the Home and Hobby exhibits are. We parked pretty far away to avoid the terrible one-way traffic funnel through the fairgrounds, so everyone helped me carry my hot heavy handmade things back to the car. And then we all hung out together the whole evening and cooked dinner on the grill and talked and had the best time. So! What shall I enter next year? 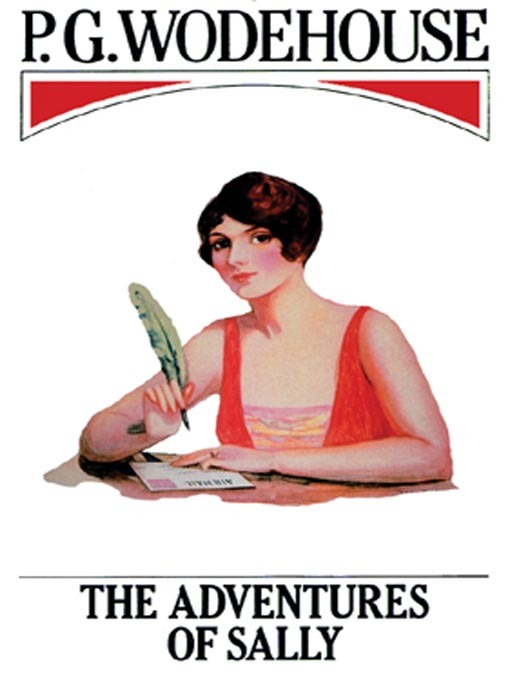 The Adventures of Sally, by P. G. Wodehouse. First published in 1922. Read for you by Kara Shallenberg. I’ll post another chapter next Monday. I was really worried that I’d be too sick to go to the fair this year, but I started feeling better last week so Dan, Chloe, and I went last Friday, and then Henry and I went again last night! Dan took photos of my Home and Hobby entries, so I’ll have to post those later, but I remembered my camera last night and got a few fun shots. I’ll post some here and then you can see the rest on my flickr. First thing we did was get fresh Squeezers lemonade, and then we went to the infield to see the Oasis Camel Dairy demo. Very interesting! And then we went home. We had a great time!